Compressed Air contains dirty oily water (also known as condensate) and without the correct drainage or condensate management the dirty oily water in the compressed air can cause corrosion, rusting and blockages in your system and tools. DS Filtration has an extensive range of products including Oil Water Separators (OWS), Condensate Drains and Timed-Solenoid Drains to remove condensate from air line systems and the treatment of condensate for environmental protection. DS Filtration is a stockist of a range of OWS from Sepura along with an extensive range of service kits for Atlas Copco, Domnick Hunter/CompAir, Jorc, Sepura, Ultrafilter and Zander. Oil Water Separators - are designed to remove oil from condensate extracted in compressed air systems. They are made up of activated carbon and filtration media. Oil Water Separators allow you to safely dispose of the waste oil in an environmentally sustainable method and re-cycle the clean water back into your system if required. DS Filtration offers the Sepura Nano S range of Oil Water Separators. Designed as a simple, effective and environmentally friendly unit, we have models to suit air systems up to 10,000 scfm. 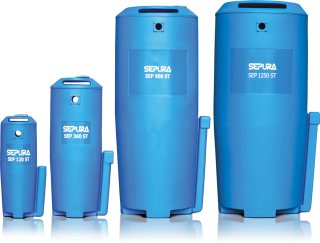 Download our range of Sepura Oil Water Separators and Service Kits technical data sheet now. Download our range of Alternative Carbon Kits from leading manufacturers Atlas Copco, Domnick hunter, CompAir, Ultrafilter, Zander and Jorc. Timed-Solenoid Drains (Condensate Drains), automatically drain the condensate from filters, dryers, receiver tanks in compressed air systems. The intervals at which the drain automatically discharges and the length can be set and adjusted using the electronic timer. These are most commonly used in refrigerant dryers, after-coolers, separators and recievers. Image to the right shows the 1/2" Timed Solenoid drain (TDCS728) along with a 20B Cannon Ball drain. Download our range of External, Eectronic and Mechanical drains. Filter Housing Drains, sit within the filter housing and are designed to float within the filter chamber (also known as internal float drains). When condensate builds up the drain floats upwards, which in turn raises the value allowing the condensate to be discharged. Image to the right shows a IDK400B suitable for DS Filtration FP Series Filters, Zander, Conquest and OMI filter housings along with the KA 1/2" suitable for Ultrafiltes 90 Series and DF range. Download our range of Internal Housing Drains. DS Filtration is also a stockist of loose desiccant that we can ship by the kilogram, 20kg bag or drum (depending on your requirements). activated alumina - a spherical absorpent (3-4mm in diameter) with a high surface area, adsorption capacity and abraison resistance. activated carbon - a specialised grade of activated carbon that absorps odours from volitile organic compounds. It comes in cylindrical pellets 0.8-5mm. Would you like more information on condensate management or which drain your system needs?